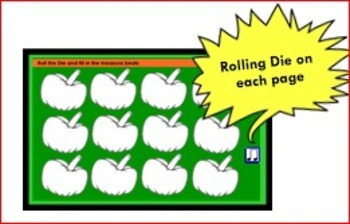 This activity can be illustrated at the SMARTBoard (with rolling rhythm die widget) and then children can complete the activity by themselves with the attached worksheet or Explain Everything iPad file and their own musical die. You could even use the SMART Board or iPad as a center. 2. 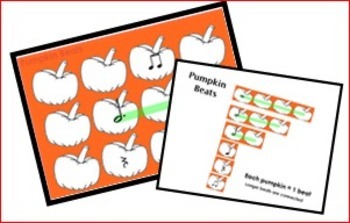 In “Pumpkin Pull,” students pull rhythm pieces from the right side to correctly fill up the 3 measures of pumpkin beats. For added fun, students can race the Ghost of 16 seconds or the Ghost of 25 seconds. The kids have to fill the beats before the music ends. My students absolutely LOVE this game and try hard to beat the musical clock. It’s a winner! Long beats are illustrated by an attached line that connects pumpkins together. There are 10 pages in this group, but you can easily duplicate pages or create your own in a larger class. 3. 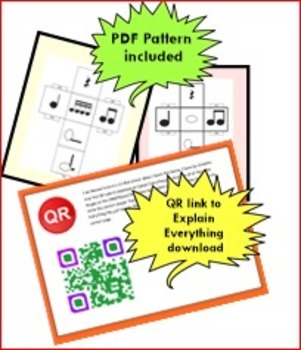 QR code linked to a downloadable Explain Everything file for those with iPads in the classroom. 1:1 iPads? Using rhythm instruments, have students play and record each rhythm page in Explain Everything. 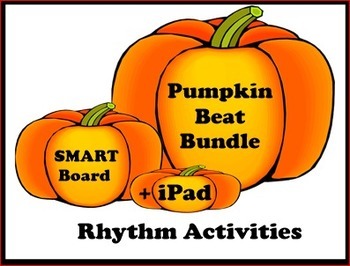 This Pumpkin Beat Bundle offers several options for rhythm activities during October. - Kid-tested fun learning with a twist of technology. Perfect for October Musical Substitutes! This would be a great activity for a substitute teacher during October. I suggest you make two-sided copies and make extra… they come back for more. For the overachiever, limit their use of the whole note!